Iran Daily, Oct 1: High-Level Regime Delegation Visits Syria’s Assad — Sign of Growing Concern? Iran has sent a high-level delegation, led by top official Ali Shamkhani, to Damascus for talks with Syria’s President Assad. Shamkhani has increasingly been used as a political “fixer” in the Iraqi and Syrian crises. However, the sudden appearance of the delegation and signals in coverage by Syrian State media pointed to concerns of both Tehran and Damascus that may have spurred the discussions. The Syrian regime has cautiously accepted the US attacks on the Islamic State and the Islamist insurgent faction Jabhat al-Nusra, but Iran has denounced Washington as a creator and supporter of the Islamic State whom it is now bombing. 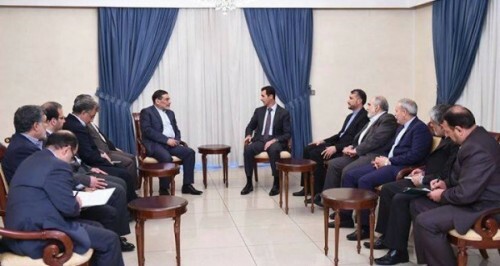 Meanwhile, Syrian Prime Minister Wael al-Halqi told Shamkhani of Damascus’s worries over Iranian support for the economy. The Prime Minister said that Iran’s $3.6 billion line of credit, arranged in July 2013, needed to ensure “the flow of Iranian goods into Syrian markets, and provide these markets’ needs in terms of supplies, consumer products, and pharmaceuticals”. He also tipped off worries over industrial production, infrastructure, and reconstrucation, as he “called on Iranian companies to invest and establish development projects in Syria”. Shamkhani also met high-level officials in Lebanon on Tuesday, including Hezbollah head Hassan Nasrallah. After a discussion with Lebanese Prime Minister Tamam Salam, Shamkhani said Iran will supply the Lebanese army with military equipment. Iranian tycoon Asadollah Asgaroladi said Tuesday that Tehran and Russia plan to replace the US dollar with their national currencies in bilateral trade. Asgaroladi, who is head of the Iran-Russia Joint Chamber of Commerce, said the step would spur economic collaboration between the two countries. Earlier this Iranian Oil Minister Bijan Namdar Zanganeh, after meeting his Russian counterpart, said that the two countries had agreed to conduct banking transactions in rials and rubles. Asgaroladi’s announcement came just after President Rouhani discussed economic matters with Russian President Vladmir Putin at a summit in southern Russia. Seven Iranians who made a video, in which they celebrated life by dancing to Pharrell Williams’ “Happy”, have been given 99 lashes each. The punishments have been suspended for three years on condition of good behavior. A court condemned the men and women for “illicit relations”, also fining them 600,000 Tomans (about $200) each for the “vulgar video”. One of the seven, Reyhaneh Taravati was given a six-month suspended prison sentence. According to the lawyer for the defendants, alcoholic beverages were found in her premises. President Rouhani’s attempt at engagement with Britain — symbolized by a historic meeting with British Prime Minister Hassan Rouhani last week at the United Nations — appears to have crashed, thanks to Iranian MPs. The legislators have continued a barrage of criticism of Cameron’s speech to the UN General Assembly, after his meeting with Rouhani, which criticized Iran over a series of issues, including “support for terrorist organizations, its nuclear program, [and] its treatment of its people”. Parliament’s National Security Commission has demanded a formal apology. “Given the British prime minister’s insult to the Iranian nation, the Majlis will never allow for an upgrade in the level of relations between Iran and Britain above the status quo,” Mansour Haghighatpour, the Vice-Chairman of Parliament’s National Security Commission, said on Tuesday. Rouhani said on Monday that Cameron’s comments were “incorrect and unacceptable”. The Rouhani Government had envisaged the reopening of Embassies in London and Tehran after almost three years. In November 2011, a crowd stormed the British Embassy’s compound in Tehran. The British Government responded by closing the Iranian Embassy and expelling the diplomats. Last year, following a meeting between British Foreign Secretary William Hague and Iranian Foreign Minister Mohammad Javad Zarif at the UN, the two countries agreed to appoint non-resident chargé d’affaires. Iranian Foreign Minister Mohammad Javad Zarif has announced that nuclear talks with the 5+1 Powers (US, Russia, China, Britain, France, and Germany) will resume next week. “We will resume talks in 10 days,” Zarif told the Russian agency ITAR-TASS on the sidelines of the Caspian Sea summit in Astrakhan in southern Russia. Negotiations for a comprehensive nuclear agreement were adjourned in New York last weekend after 10 days. The two sides are seeking a resolution before the expiry of interim arrangements on November 24. “These are meetings with ministers of separate countries, not all the G5+1 mediators,” he added. Meanwhile, Zarif noted that the composition of negotiators from the G5+1 mediating group depended on EU Foreign Policy Chief Catherine Ashton who coordinates the G5+1 tasks.